Located in San Diego, California. 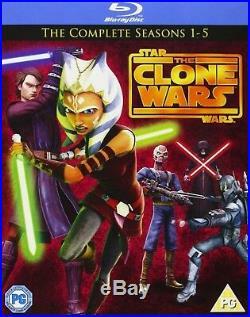 Star Wars-Clone Wars Season 1-5 [Blu Ray] Season 1 2 3 4 5 Box Set. We value your business and will do anything to provide the absolute best customer experience. Ships From The USA Brand NEW If Digital Downloads included, It is Only Valid In The UK. The complete seasons one to five of the CGI-animated TV show. Set in a galaxy far, far away after the events of'Star Wars Episode II - Attack of the Clones' (2002) and before'Star Wars Episode III - Revenge of the Sith' (2005), the series follows the adventures of Obi-Wan Kenobi (voice of James Arnold Taylor), his apprentice, Anakin Skywalker (Matt Lanter) and rebellious female Jedi fighter Ahsoka Tano (Ashley Eckstein). Season 1 episodes are:'Ambush','Rising Malevolence','Shadow of Malevolence','Destroy Malevolence','Rookies','Downfall of a Droid','Duel of the Droids','Bombad Jedi','Cloak of Darkness','Lair of Grievous','Dooku Captured','The Gungan General','Jedi Crash','Defenders of Peace','Trespass','The Hidden Enemy','Blue Shadow Virus','Mystery of a Thousand Moons','Storm Over Ryloth','Innocents of Ryloth','Liberty of Ryloth' and'Hostage Crisis'. Season 2 episodes are:'Holocron Heist','Cargo of Doom','Children of the Force','Senate Spy','Landing at Point Rain','Weapons Factory','Legacy of Terror','Brain Invaders','Grievous Intrigue','The Deserter','Lightsaber Lost','The Mandalore Plot','Voyage of Temptation','Duchess of Mandalore','Senate Murders','Cat and Mouse','Bounty Hunters','The Zillo Beast','The Zillo Beast Strikes Back','Death Trao','R2 Come Home' and'Lethal Trackdown'. Season 3 episodes are:'Clone Cadets','ARC Troopers','Supply Lines','Sphere of Influence','Corruption','The Academy','Assassin','Evil Plans','Hunt for Ziro','Heroes On Both Sides','Pursuit of Peace','Nightsisters','Monster','Witches of the Mist','Overlords','Altar of Mortis','Ghosts of Mortis','The Citadel','Counterattack','Citadel Rescue','Padawan Lost' and'Wookiee Hunt'. Season 4 episodes are:'Water War','Gungan Attack','Prisoners','Shadow Warrior','Mercy Mission','Nomad Droids','Darkness On Umbara','The General','Plan of Dissent','Carnage of Krell','Kidnapped','Slaves of the Republic','Escape from Kadavo','A Friend in Need','Deception','Friends and Enemies','The Box','Crisis On Naboo','Massacre','Bounty','Brothers' and'Revenge'. Season 5 episodes are:'Revival','A War On Two Fronts','Front Runners','The Soft War','Tipping Points','The Gathering','A Test of Strength','Bound for Rescue','A Necessary Bond','Secret Weapons','A Sunny Day in the Void','Missing in Action','Point of No Return','Eminence','Shades of Reason','The Lawless','Sabotage','The Jedi Who Knew Too Much','To Catch a Jedi' and'The Wrong Jedi'. We strive to offer high quality products and service to our customers. NEW PRODUCT GUARANTEE : We 100% Guarantee That All New Products Will Be Delivered In Brand New Condition In Original Packaging. The item "Star Wars-Clone Wars Season 1-5 Blu Ray Season 1 2 3 4 5 Box Set" is in sale since Tuesday, August 21, 2018. This item is in the category "DVDs & Movies\DVDs & Blu-ray Discs". The seller is "shark_tank_media" and is located in El Cajon, California. This item can be shipped to United States, Russian federation, Canada, United Kingdom, Denmark, Romania, Slovakia, Bulgaria, Czech republic, Finland, Hungary, Latvia, Lithuania, Malta, Estonia, Australia, Greece, Portugal, Cyprus, Slovenia, Japan, China, Sweden, South Korea, Indonesia, Taiwan, South africa, Thailand, Belgium, France, Hong Kong, Ireland, Netherlands, Poland, Spain, Italy, Germany, Austria, Bahamas, Israel, Mexico, New Zealand, Philippines, Singapore, Switzerland, Norway, Saudi arabia, Ukraine, United arab emirates, Qatar, Kuwait, Bahrain, Croatia, Malaysia, Brazil, Chile, Colombia, Costa rica, Dominican republic, Panama, Trinidad and tobago, Guatemala, El salvador, Honduras, Jamaica, Antigua and barbuda, Aruba, Belize, Dominica, Grenada, Saint kitts and nevis, Saint lucia, Montserrat, Turks and caicos islands, Barbados, Bangladesh, Bermuda, Brunei darussalam, Bolivia, Ecuador, Egypt, French guiana, Guernsey, Gibraltar, Guadeloupe, Iceland, Jersey, Jordan, Cambodia, Cayman islands, Liechtenstein, Sri lanka, Luxembourg, Monaco, Macao, Martinique, Maldives, Nicaragua, Oman, Peru, Pakistan, Paraguay, Reunion, Viet nam, Uruguay.